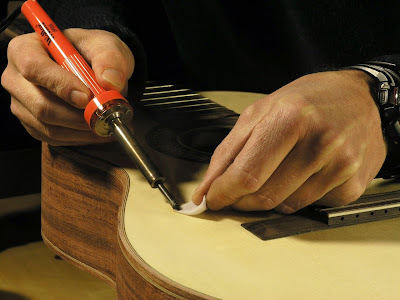 Then the whole guitar was inspected from A-Z in an attempt to locate all the dents, gaps, scratches and other imperfections. Inevitably there was a few around, but generally speaking it wasn't too bad. 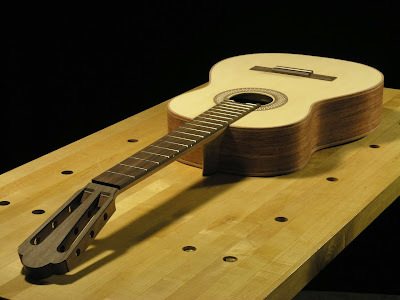 The two worst cases was a fairly deep ding in the soundboard and a tear out from the spokeshave on the side of the fingerboard. That occurred when it was trimmed flush with the neck. 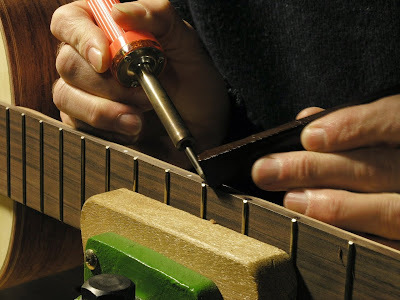 I was considering using the shellac stick to fill the tear out on the fingerboard, but after my experience with the soldering iron I decided just to fill it with some 5-min epoxy, which seemed to work very well. I thought of tinting the epoxy with saw dust but decided not to and just use it clear. It somehow seemed to make a more invisible repair showing the grain of the wood as opposed to having a homogeneously colored blob of filler covering it up. I made an attempt to steam out the ding in the soundboard using the soldering iron and a damps cloth the create steam. I went at it for quite some time but even though it did lift the indentation, I wasn't able to raise it completely. Eventually I gave up and decided to leave it till later and then decide how to proceed to fix it, if at all. Other stuff I noticed included small gaps around the bindings but these seemed insignificant enough to be left alone. One of the more hidden flaws I detected were tiny ridges left from the plane blade on the back and sides. At this point I had not done any sanding on the surface of the body and these ridges became apparent once the body was held up against a low light. This took me by surprise as I had be very careful to avoid this very thing. But there they were laughing me straight in my face. 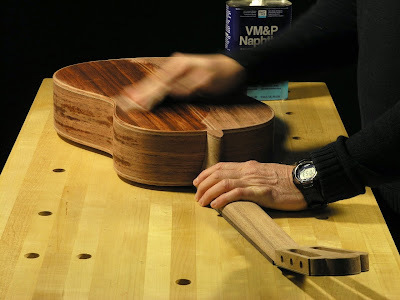 I also noticed some waviness running across the grain of the sides together with a few places where the bindings hadn't been trimmed completely flush. I carefully used a scraper to level all these blemishes the best I could. Next up was rounding the sides. Some people like to create a very soft rounded edge around the body, but personally I prefer a sharper, more defined edge. In his book Ervin Somogyi states that Eugene Clark recommends using a smooth file for this, working with deliberate stokes in one direction only. I tried this, but I never really got to grips with it. I couldn't really see the benefit of this approach and I had a hard time working in a smooth edge around the inside curve of the waist area. Soon I switched to a cork backed sanding block with 120 grit garnet paper which I had an easier time with. 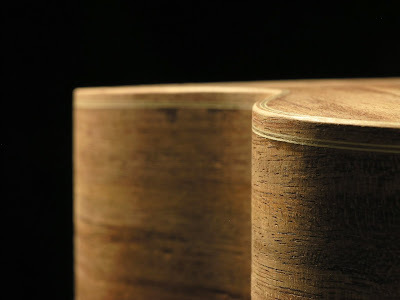 First the edges was treated to a small single bevel that then was rounded over. 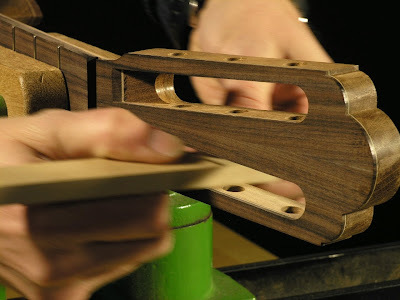 Having the bevel made it easier to control the homogeneity and evenness of the edge all the way around the body. The head needed some attention too. 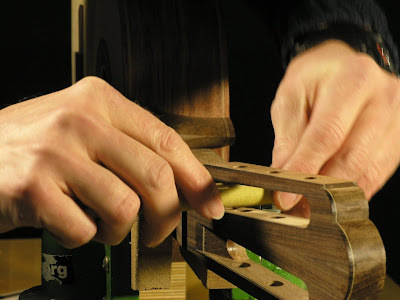 The inside of the string slots showed traces of chisel marks from when they were done initially. Likewise a few marks from the drill bit were traceable a the end of the slots. The inside of the slots were sanded with a flat sanding stick with some of StewMac's Stickit paper, first with 120 grit followed by 220 grit. 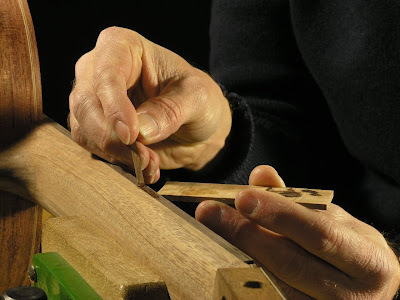 The rounded ends got a similar treatment though this time a piece of dowel was use as a sanding stick. Like the body the edge of the head and string slots were softened a little, though not quite as much. 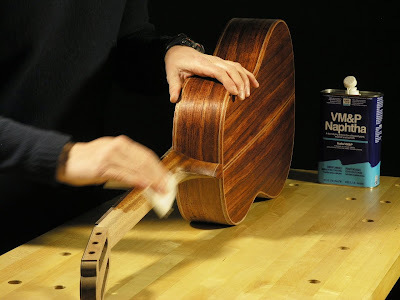 Now the whole guitar was wiped with Naphtha and inspected once more to see if any other blemishes were showing up. 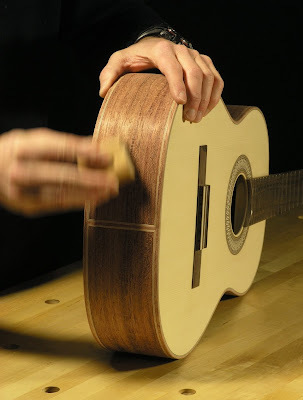 As it looked fine to me I proceeded to sand the entire guitar with 120 grit garnet paper. I really don't like sanding but I guess it has to be done. All that dust everywhere, yuck! 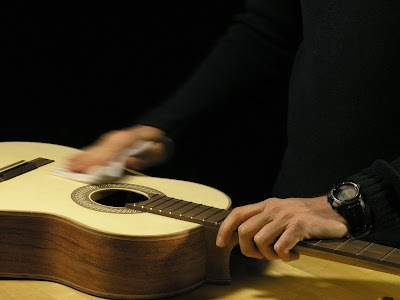 Then it was time to gently wipe the guitar with a very tightly wrung damp cloth. This raised the grain a little and got rid of most of the dust left on the surface from the sanding. 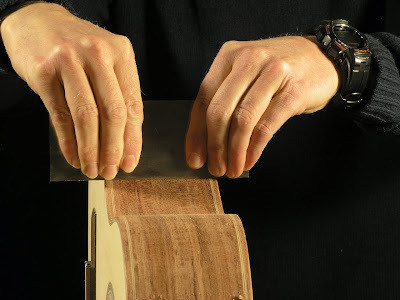 The raised grain was leveled by a final sanding using 180 grit garnet paper. 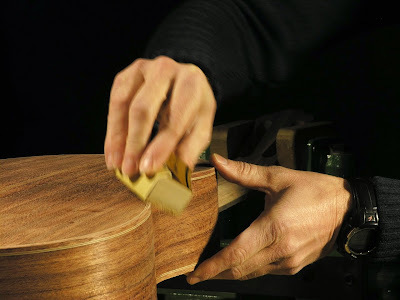 Some people continue sanding ending up with much finer grits, but Eugene Clark recommends stopping a 180 or 220, in order to avoid clogging up the pores with dust, or chocking it as he puts it. I believe Cumpiano recommends stopping at 220 too. Either way it suited me fine keeping sanding to a minimum. 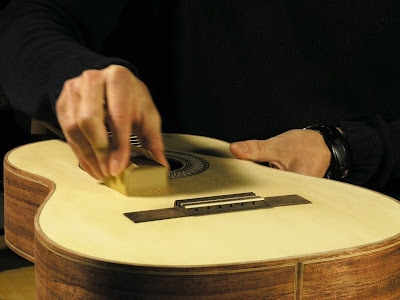 When all was done the entire instrument was dusted and wiped with Naphtha again to get rid of the last bit of dust allowing for one final inspection.